What do you cal this striped milti color wrap on his Ludwigs? concur... it was available for a while. I had an old remo shell (8") that had 3 quadra wraps on it...so the salesguy could show examples of what they actually looked like. KO and some others have drums in that finish. It is called Salesman Sample, I believe. I have also seen pictures of it on a 45 degree angle which is also a cool look. They are cool. I got mine through Russo music back when Steve D. was there making killer deals on stuff. Classic Maple 12/14/16/20 and I have both 5" and 6.5" matching snares. Those look great KO. I can honestly say that this particular wrap looks even better in person. I too would love to own a set a some point. Probably start with a snare. Started with the snare, then added the rest. 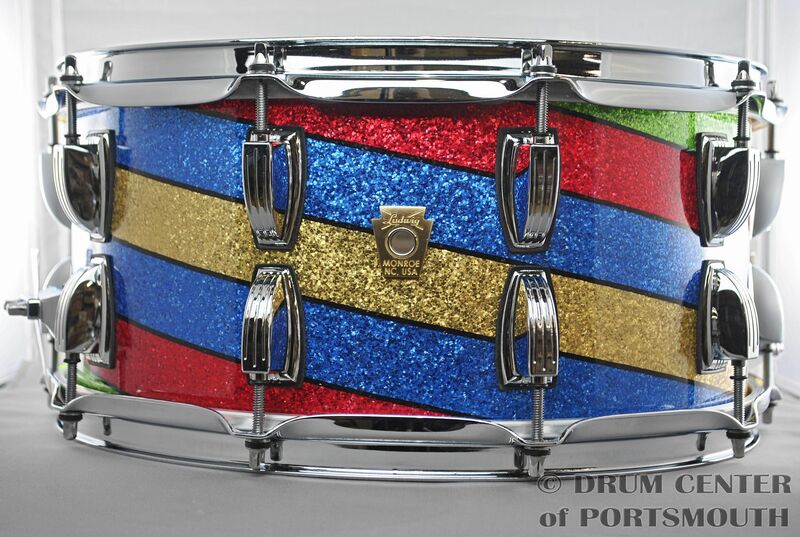 I dig the Twisted Salesman finish, but I've only ever seen it on snares. 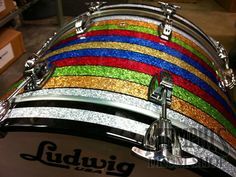 Ludwig titled the wrap "Salesman Sample", but the correct name back in the day was "banded pearl". Salesman sample drums were usually marching drums with vertical "bands" of pearl, and various lugs the company had to offer. "Twisted Salesman" snare drums were made because Ludwig ended up with extra floor tom wrap because of the format in which they had to purchase all the various sheets of wrap for the entire kit. So, someone at the factory (probably Jim C or Kevin P) said "Let's take the extra floor tom sheets and wrap some snare drums, at an angle"! That's why Twisted Salesman is only snare drums. I'd have to dig it out but I have a remo 8" drum like that. It was the color sample demo drum ina local shop umteen years ago and friend of mine bought it for 10 bucks. He gave it to me. I used it to hold sticks gor a while. The originals had individual bands of different colored wrap on them. The modern ones are sheets with the pattern printed on them. The black lines between the colors mimic the spaces that would open up on the originals between the bands as the wrap shrunk a bit. As far as I know Ludwig sold out on the wrap they had, although they could probably easily have more made up since the colors are printed on the wrap. Since they needed to find a way to dispose of the "leftover" wrap (the "twisted" snares) it seems unlikely that they would be re-issuing it anytime soon. You probably could special order the wrap itself from Delmar through Precision as a custom design and I think either Walopus or Bumwrap (maybe both) already have a version of something similar in their catalog. The originals are very rare. I recall that Bun has (or had) some. An original snare popped up on the Salvation Army or Goodwill auction site a few years back. Someone had donated it in Iowa City (not all that far away from me....DAMN! to have been in that parking lot to intercept that drum that day). It ended up selling for $3 grand thru the auction, I heard that then it was resold for $7 grand. Those are some serious stripes. Here's a few originals...not mine. I've never seen the real thing before, just the modern reproductions. Those are killer. I'd love to own all those! I too would LOVE to have an original snare or kit.